Rocks Landing started life as a snack bar for Chimney Corners Resort. Once called the Beach Dining Room, it was built in the 50’s by Jim Rogers Sr., and offered breakfast and lunch for both resort guests and the public before closing down in 2014. The space was used as a “clubhouse” for guests, but owners Jim & Mary Rogers and resort chef Steve Tebo knew it could be so much more. With water literally lapping inches away from the deck and incredible views, this was an unparalleled opportunity to offer guests a truly memorable dining experience as the only Crystal Lake waterfront restaurant. Steve, along with wife Kristin, and partnered with sister Julie Tebo and her husband, Paul Danes, envisioned creating a unique space with an eclectic and interesting dinner menu. Working in tandem with building owners Jim & Mary Rogers, the space was renovated with a modern kitchen and urban touches, while retaining the vintage character of the building. The deck space was enlarged and partially enclosed to encourage three season dining, as well as open air seating for sunny days. Named for the Roger’s men (nickname: “Rock”), Rocks Landing is both an homage to the man who built the space, and as a symbol of our commitment to friends, the community and our northern Michigan lifestyle. Executive Chef Joe Meyers brings his culinary experience from Portland, Oregon to blend with Tebo’s passion for local, sustainable foods to create flavorful dishes with a myriad of ethnic influences. Shareable, smaller plates of seafood, fresh vegetables and “tapas” like entrées pair with a small, thoughtful wine list as well as several Michigan craft beers. 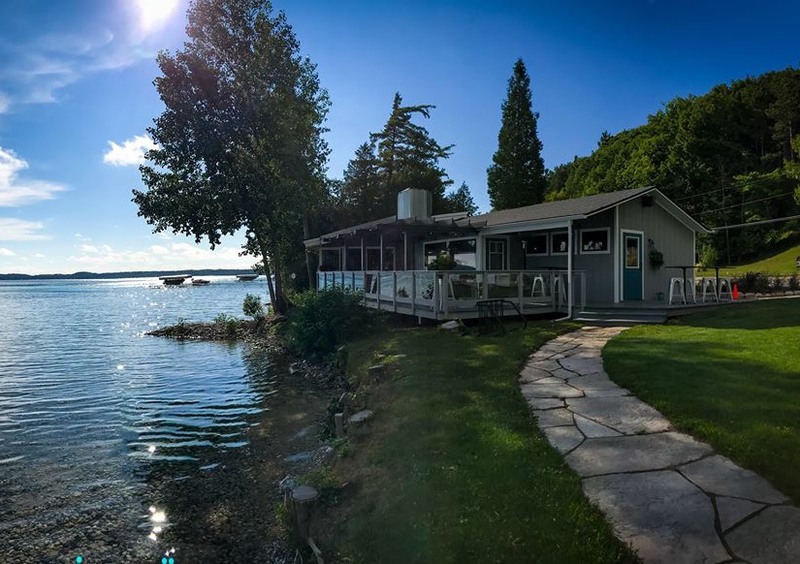 Open Tuesday through Sunday, Mondays are reserved for the traditional Chimney Corners Resort picnic BBQ on the Rocks Landing lawn. Reservations are recommended. Open seasonally, May through October. Below are the latest postings from the Rock’s Landing – Crystal Lake Page On Facebook. Please note: your cannot use Resy to book for the special tasting menu nights. Call us at 231-399-0158 to reserve! How do we sign up? Todd and I would love to sign up! Cynthia Huck Williams should we sign up? Coming this season: Book your table online! A window seat drinking hot rum and watching ice melt. Got a fireplace too? Still icy. Excited to join you this summer. Jim Sills.... Let me know what you think of this restaurant! Here are the latest photos of Rock’s Landing – Crystal Lake via instagram. If you have an instagram photo to share of your visit to Rock’s Landing – Crystal Lake, choose “Rock’s Landing – Crystal Lake” as your location and your photos will appear in the photo stream below.